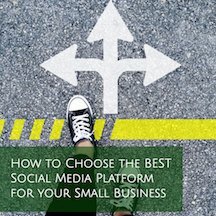 Let’s say you’ve already determined what social media platforms are the best for your specific business, you’ve created your chosen social media profiles, and you’ve optimized each social media profile or page in every way possible. The next step after that – and forever into the future – is figuring out what type of content you are going to post to your chosen social media profiles. 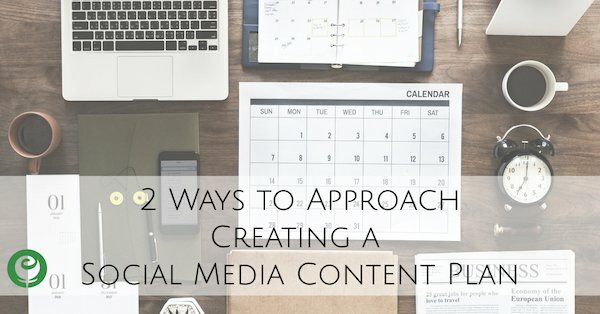 While content itself is limitless, there are 2 main ways to approach how you’ll create a plan for your social media content. Before we dive into the 2 approaches to your social media content, let’s cover what you need to have – or at least have decided on – ahead of planning your content. Your brand’s voice as this will directly impact the copy you are writing for all social media posts, and if things like emojis will be incorporated into your posts. A list of other marketing and advertising tools and tactics you’re also employing as part of your overall marketing and advertising strategy. With that being said, let’s take a look at how to approach your social media content planning from a content topic approach and from a “driven by offline” approach. Here’s what each means. When planning your social media content, you may plan by week, by month or by quarter. It’s not necessary (and, in fact, I’d say it’s discouraged) to plan content for an entire month or more at one time. News and viral posts quickly get old, and social media platforms can change their rules over night. If you want the best relevant, timely, and engaging content possible, you need to limit your advanced planning and scheduling. With this approach, you may simply decide how many times a week you want to post and just plug in posts on any of your topics, as you come across them. You may also have a loose schedule like designated time(s) of the day or day(s) of the week that you publish posts that drive traffic to your website or store in some way, then something lighter or funnier for Fridays, since it’s the last day of the work week, and more serious or educational content in the mornings when people are catching up on news when they get started at work. This approach gives you a lot of flexibility because you know that if you curate content that fits for your audience, you simply add it to your queue, and you’re set. Social media has felt like it put a crimp in the well-oiled marketing plans for a lot of brick and mortar businesses. But the good news is that you, as the business owner, can still operate the same way you’ve always done and use social media as merely a complementary amplification avenue to your existing offline efforts if you choose. To create a content plan for your social media that’s driven by your offline business, you’ll need to begin by plotting out your in-store promotions, specials and events, and your email marketing campaigns on your social media calendar, and then figuring out your promotional posts that support those offline promotions, specials and events, and email marketing campaigns, and then fill in the rest of your calendar with non-promotional/curated content that’s related to and supports what’s going on in-store. Restaurants and bars are easy examples of this as the chef or manager is the one to decide on daily specials, which can then be discussed on social media. Retailers of all types are also excellent candidates for this approach because often there’s seasonality to their inventory and sales, and if people are going to shop your business for a holiday or new season of the year, other content that ties in that holiday or season is very topical and relevant to them. So if you feel a bit overwhelmed about how to work this new fandangled social media marketing stuff into your current marketing plan, think of social media as a supporting actor to your feature film. There’s no wrong way to approach your social media content, but it is possible to keep things pretty flexible while still having a plan.